The volume is devoted to the Dynamics of Rods. It is a sequel to "Statics of Rods" by the same author. 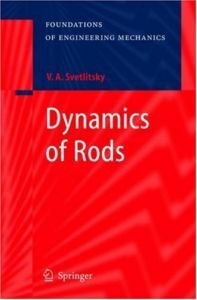 The main goal of the book is to present systematically theoretical fundamentals of the mechanics of rods as well as numerical methods used for practical purposes. Linear and nonlinear equations governing a rod's oscillations are presented. Methods of determining eigenvalues and eigenfunctions in conservative and non-conservative problems are given, along with numerical methods dealing with forced, parametric, and random oscillations of rods. Some issues of interaction of rods with air (liquid) flows and the dynamics of space-curved rods containing flows of liquid are considered. The book consists of nine chapters and appendices and may be conventionally divided into two parts. That is, the main theoretical material and the application of the theoretical results to problems of practical interest. Problems for self-study are found in Chapters 3, 5, and 7 and solutions are given in Appendix B.